We recently wrapped up our fourth season of monitoring Eastern Indigo Snakes (Drymarchon couperi) and Eastern Diamondback Rattlesnakes (Crotalus adamanteus) in the Altamaha River drainage of southeast Georgia. This monitoring involves surveying 40 intact sandhill sites with high densities of Gopher Tortoise (Gopherus Polyphemus) burrows. These burrows are the preferred overwintering refuge for Eastern Indigo Snakes. Due to poor weather conditions or just poor luck, we may not find an Indigo Snake during any given survey, even though they may be present on the site during the survey. They may be deep in a tortoise burrow, or on the surface but hiding in dense vegetation or debris making them difficult to spot. To account for the chance we will miss seeing a snake, we survey each site 4 times every season. This not only gives us multiple chances to find a snake on that site, but also allows us to estimate the chance that we will detect an Indigo or Diamondback, statistically, given they are present at the site. During this year’s surveys we found Indigo Snakes at 13 of our 40 sites and had 42 total observations. 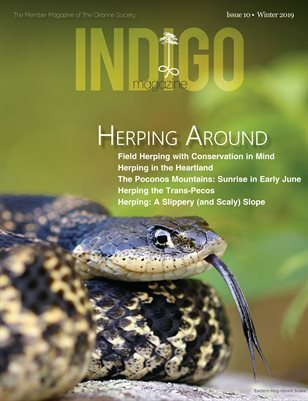 We were also able to find an indigo snake on one site we had not found them on in the past three years. Because Indigos exhibit a high degree of fidelity to overwintering sites, meaning they usually return to the same site every winter, it is not common to find them on sites that we have not seen them on before, so this was a nice find. We also found Eastern Diamondbacks at 14 of the 40 sites with 19 total observations, including finding Diamondbacks on 3 sites we had not found them on before. The most interesting observation this field season, though, came outside of our monitoring surveys when two of us were lucky enough to witness male combat. This is an exciting moment for any herpetologist, as it is rarely witnessed in the wild, and may be a once in a lifetime experience. Having no arms or legs can make fighting over a reproductive female difficult, so they intertwine their bodies and attempt to pin the other snake to the ground. This goes on until one snake gives up, leaving the winner with the right to mate. After the larger of the two individuals won, we used our Gopher Tortoise burrow camera to spy another Indigo Snake down at the back of the closest burrow to the battle, this presumably being the female that the two males were lusting over.